The mobile communication sector is still in transition. During the first quarter of 2016 (Q1 2016), the global macro-cell mobile infrastructure market totaled $10 billion. That's a decline of 18 percent sequentially, which effected all regions of the globe -- except Japan, North America and Mexico. The mobile infrastructure market is also down 8 percent on a year-over-year basis, signaling it has entered the post 4G Long Term Evolution (LTE) peak era. As a result, LTE was down 23 percent quarter-over-quarter and down 6 percent year-over-year, according to the latest worldwide market study by IHS. For the first time since the beginning of 4G LTE rollouts in 2012, all generations of mobile communication technologies experienced a sharp decline. Even India, the only BRICS (Brazil, Russia, India, China and South Africa) nation bright spot last year, slowed down dramatically in Q1 2016 due to spectrum issues and various deals between local mobile operators. And China was no help -- with mobile infrastructure peaking there last year -- and with double-digit declines in evolved NodeB (eNodeB) deployments expected this year. Revenue for software that goes with 2G, 3G and 4G networks grew 17 percent in 2015 over the prior year to top $15.2 billion, mostly driven by LTE-Advanced (LTE-A) upgrades. Ericsson was the market leader for macro 2G/3G/4G radio in Q1 2016, sustained by its mix of geographically distributed large tier 1 accounts. Huawei was ranked number-two, followed closely by Nokia (including the Alcatel-Lucent share). 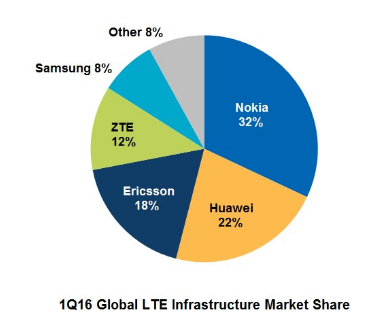 In this weak quarter, the combination of Nokia and Alcatel-Lucent propelled the merged companies into the LTE market driver's seat, ahead of Huawei. The long tail of the 2G/3G end-of-life cycle continued in the first quarter of 2016 (Q1 2016), with revenue sinking 12 percent quarter-over-quarter, just kept alive by a strong wideband code division multiple access (W-CDMA) quarter in Japan. 422 of the 494 commercial LTE networks launched to date are of the frequency division duplex (FDD) variety. Software for 2G, 3G and 4G networks is forecast to grow at a 2015–2020 compound annual growth rate (CAGR) of 9 percent and is projected to top $23 billion in 2020.